CURRENTLY FOR ONLINE WINE PURCHASES ONLY. All orders must currently be 3, 6 or 12 bottles. Harford Vineyards is currently licensed to ship only within Maryland. Orders with shipping destinations outside of Maryland will be penalized 5% of order total upon refund. Alcohol shipments require that someone 21 years or older sign for the package at the delivery address. Orders are shipped within 2 days of order. In most cases, orders received after 12pm Friday will not be shipped until the following Monday. All orders are shipped through FedEx Ground. FedEx will make 3 attempts to deliver your wine package. If you are unable to sign during any of those attempts, FedEx will return your package to the winery and additional charges may apply. We are committed to protecting your privacy. Your personal information will only be used by Harford Vineyards and will not be sold or shared with anyone. Your payment information is always safe. Our SSL software is the industry standard and among the best software available today for secure commerce transactions. It encrypts all of your personal information, including credit card number, name, and address, so that it cannot be read over the internet. If you are unable to sign for your wine package on any of the 3 delivery attempts, FedEx will return your package back to the winery. You have the option to have the package held for pick up or reshipped for an additional shipping fee. Please contact us directly at mail@harfordvineyard.com for any questions or concerns regarding delivery. Federal law states, alcoholic beverages can only be returned or exchanged if the product is spoiled, deteriorated or contaminated. 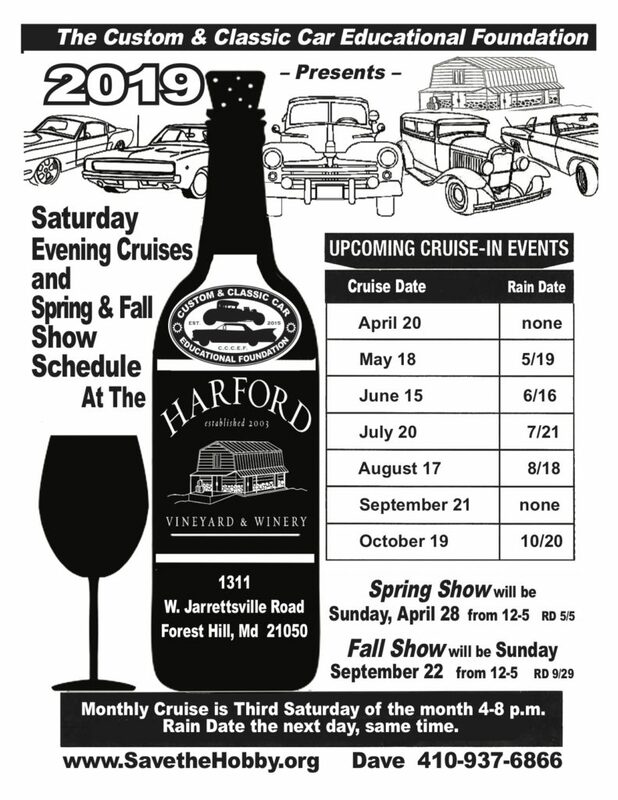 The Custom & Classic Car Educational Foundation presents Saturday Evening Cruises along with Spring & Fall Car Shows at Harford Vineyard & Winery! NO COVER! Monthly Car Cruises take place on the 3rd Saturday of the month | April – October.